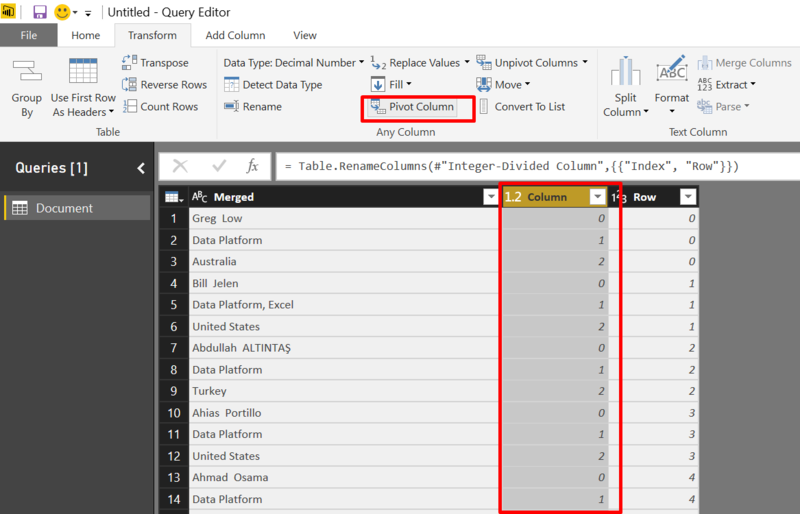 There are abundant public data sources on the Web, and it is so tempting to import and mash them up with your existing data sets in Power BI and Excel Power Query to gain new correlations and insights. 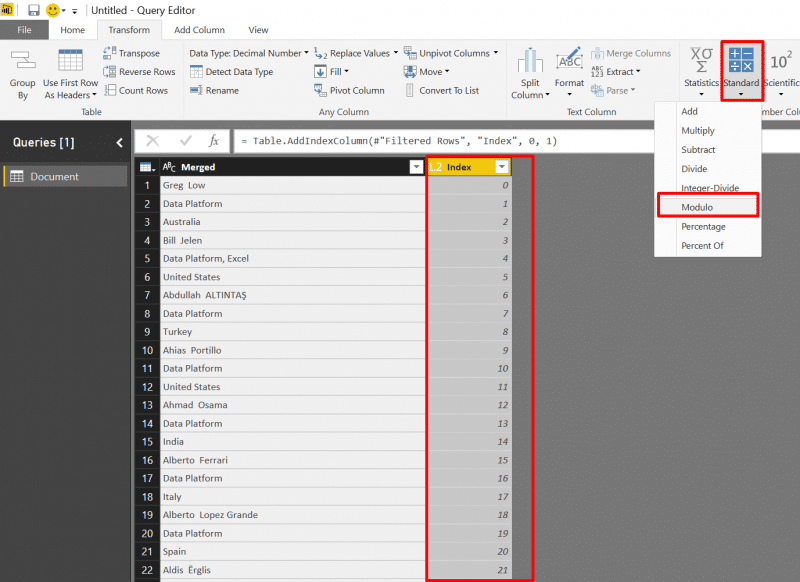 While it’s easy to import static tables from many websites in Power BI and Excel Power Query, you’ve probably found out by now that in too many cases, the tables you want to import are illusive, and inaccessible in Power BI. Have you ever encountered the following dead end experience, with no tables to import? In today’s blog post, I will share a technique that will allow you to scrap tables from web pages, by navigating the web page elements in the Query Editor, and mastering the craftsmanship of Children expansion. The good news is that you’ll not need prior knowledge of HTML. We will demonstrate the technique by web scraping the Microsoft Find an MVP search results here. To motivate you to keep reading, here is the Power BI report, that I could prepare with the data that was extracted in the page above. Before we start our challenge, let’s briefly review the simple scenario, when the import of tables is easy. 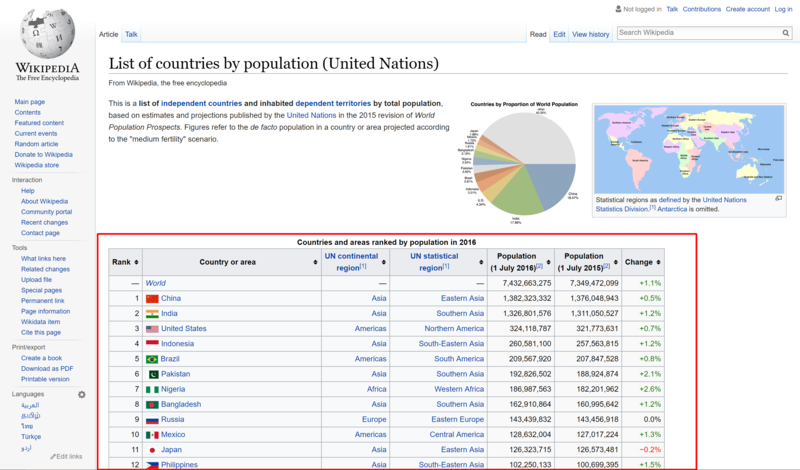 We will demonstrate it with this population table from Wikipedia (Yes, most, if not all, of the tables in Wikipedia are easily imported to Power BI). 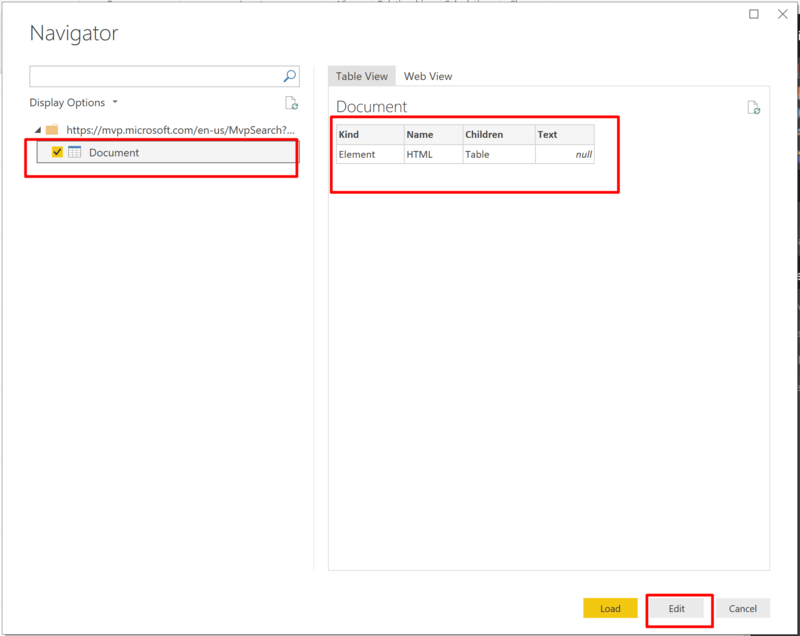 Feel free to skip this part if you are familiar with the Web connector in Power BI or Power Query in Excel. 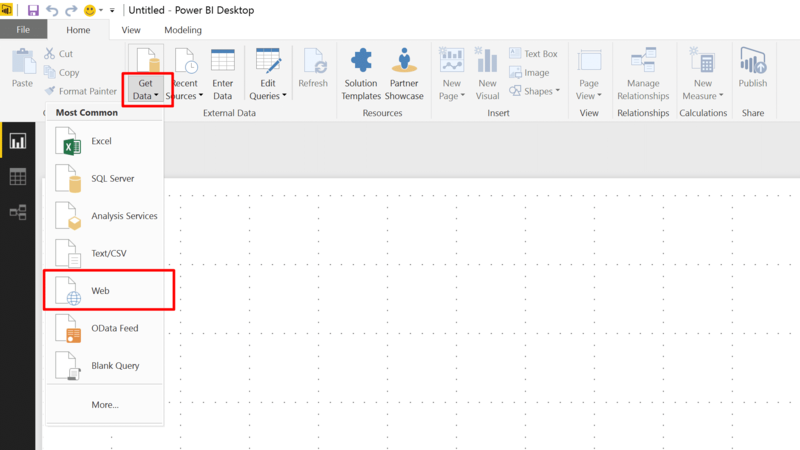 Open Power BI Desktop, and click Get Data, then click Web. If you are using Excel (with Power Query Add-In installed) you can find the Web connector in the Power Query tab. If you have Excel 2016, click Data –> New Query –> From Other Sources –> From Web. 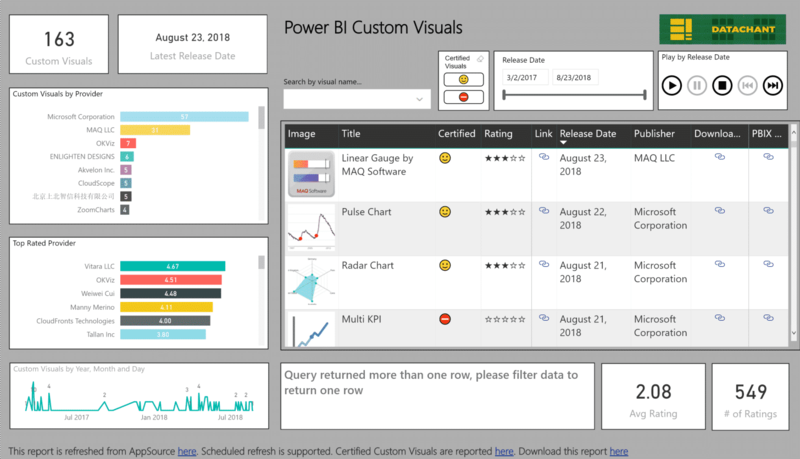 We will use Power BI Desktop in this tutorial, but the steps are the same in Excel. In From Web dialog, paste the URL below and click OK. 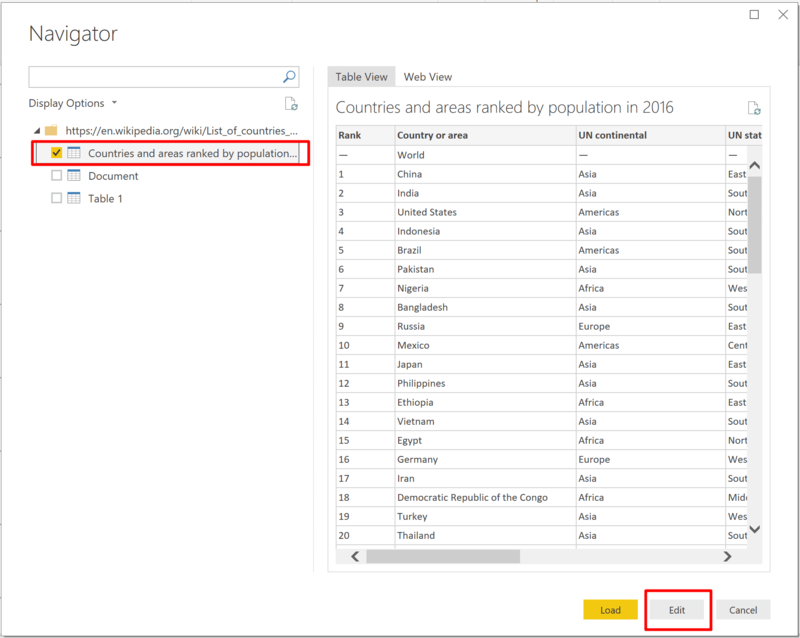 In Navigator dialog, select the table Countries and areas ranked by population… and click Edit, to clean the data in the Query Editor before it is loaded to your report. The example above was simple. 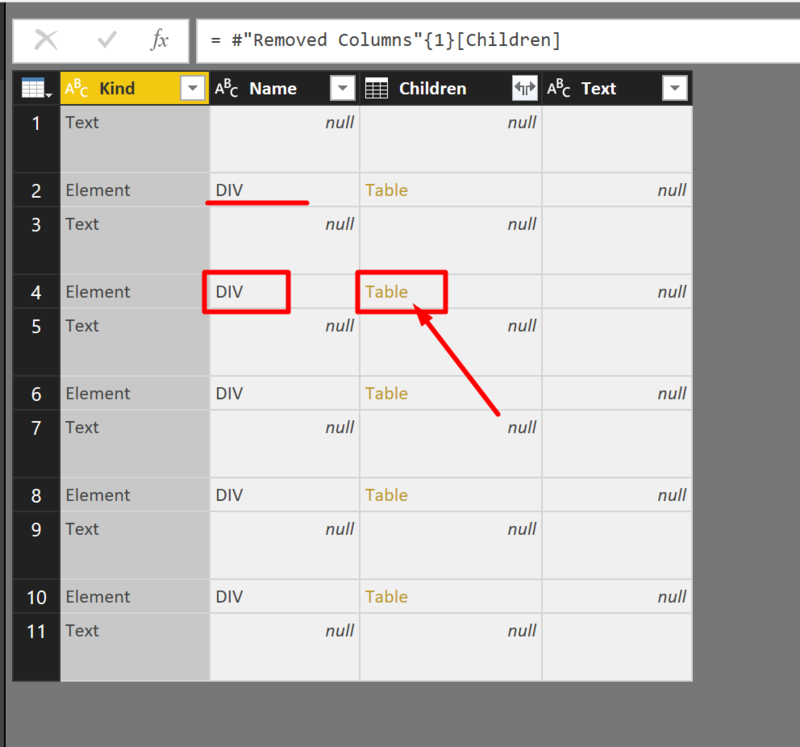 Power Query identifies the table in the HTML page, and allows you to import it in a relatively easy experience. You can find many other simple web pages to import. These web pages are usually public. They will not require to log in, and their tables are implemented using the <table>…</table> tags. Unfortunately, many tables and search results in HTML pages are implemented in different ways. 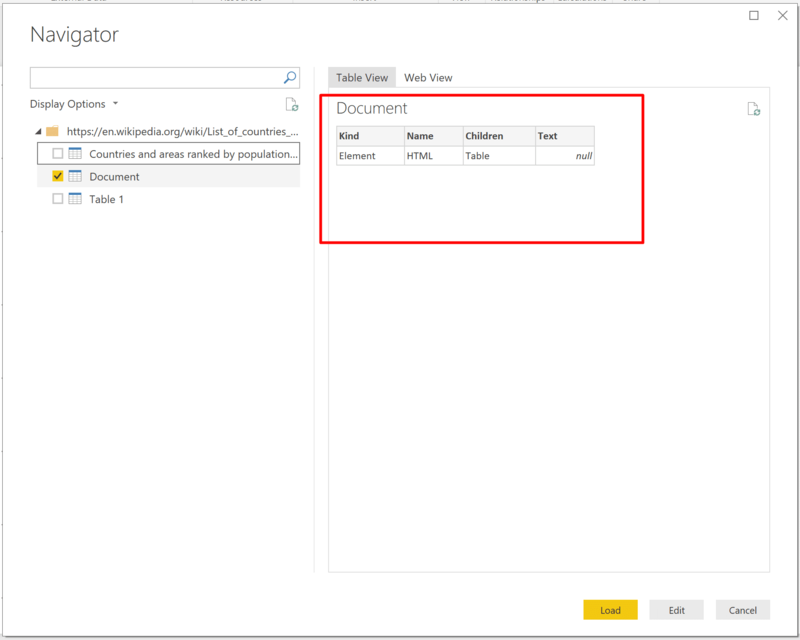 When you try to import the challenging websites in Power BI or Excel Power Query, you will end up having the Document entity in the Navigator. 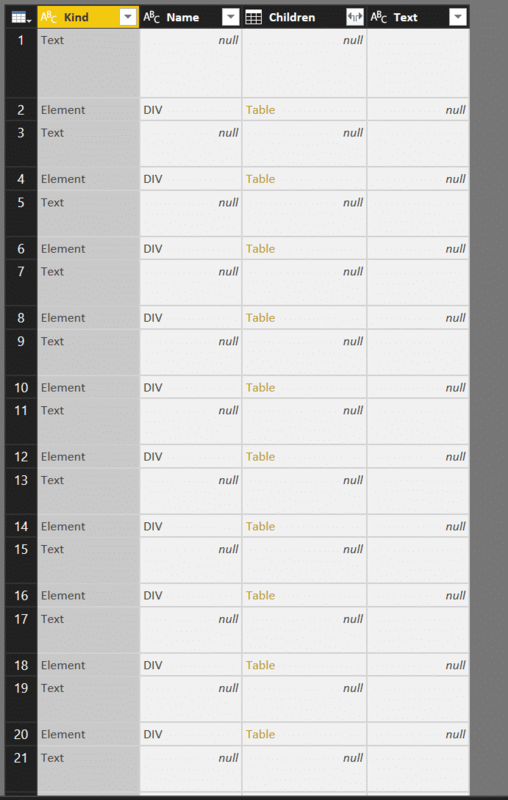 In the next part of this article, we will demonstrate how to extract tables through by editing the query and extracting the relevant elements in the HTML. 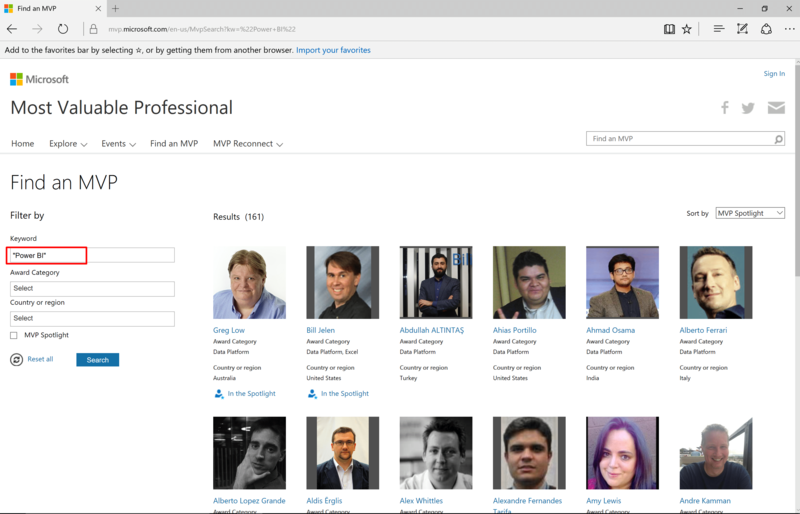 In this website, you can search for Microsoft MVPs (Most Valuable Professional) by a keyword, award category and country or region. Before we dive into the actual extraction, let’s focus on getting the entire data set (and not just a subset). When we search for “Power BI” MVPs, we can see in the screenshot there are 161 results, but we only see the first page. With a simple reverse engineering, you can find out that this attribute is used to navigate to the relevant page (pn = page number). When you find the page number in the URL, it’s a good sign. 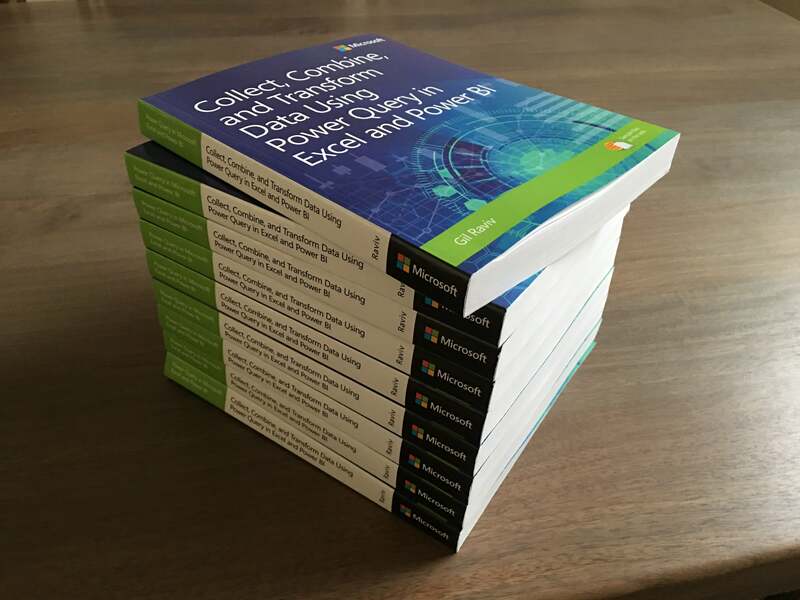 You can iterate over all the pages with Power Query. There is a great post by Matt Masson here that will show you how to do it, and if you want to iterate over multiple pages with minimal manipulations of the query expression, you can find my blog post here useful. Fortunately, we will not need it in our example. The second trick, is to find in the web page how you can define the page size. In our example, there are 3 links at the bottom right corner of the search results, that allow you to define the search results. Clicking in 40 will expand the page results to 40 MVPs. Luckily, in URL will now include the argument ps=40. 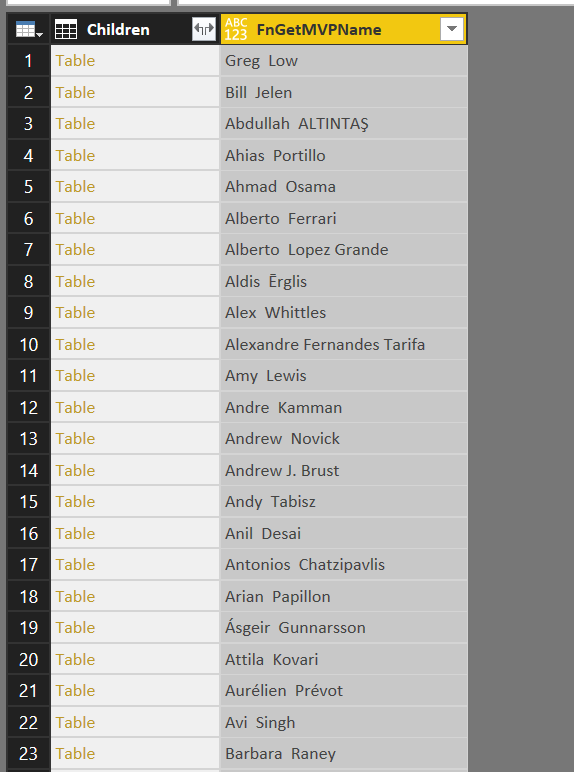 We can now try to change the number from 40 to 161 (or more), to get the entire table. Note: As I am writing this article, the number of Power BI MVP keep growing. We now have 164 MVPs, so my screenshots are not up to date. 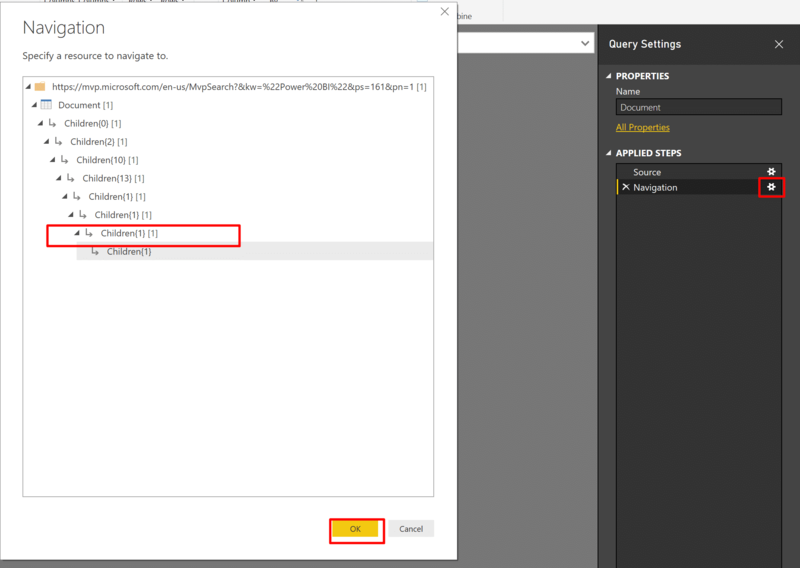 Let’s open Power BI Desktop, click Get Data –> Web and paste the URL above. When you are done, click OK. In the Access Web content, select Anonymous and click Connect. In the Navigator dialog, check the Document table and click Edit. From here, we will embark in a journey of drill down to Table objects till we reach our desired table. Each time we will click a Table object, we will get new rows with Kind, Name, Children and Text columns. To find out the correct path in our tree, we should apply a quick review of the HTML source. The following steps were done using Google Chrome. You can follow the steps on any other browser. Hover over one of the MVP names, right click and select Inspect. You can now see how a single element (MVP) in the table is represented in HTML. Notice below how many <div> elements we have. 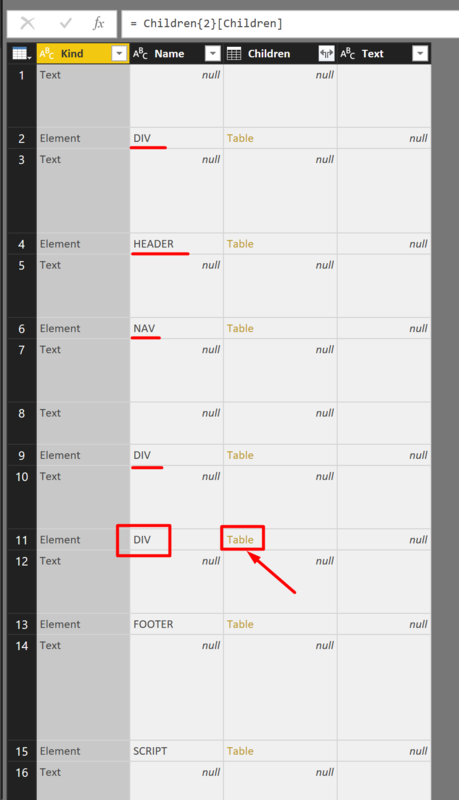 Each <div> node can be considered as a row in the table we would like to import. 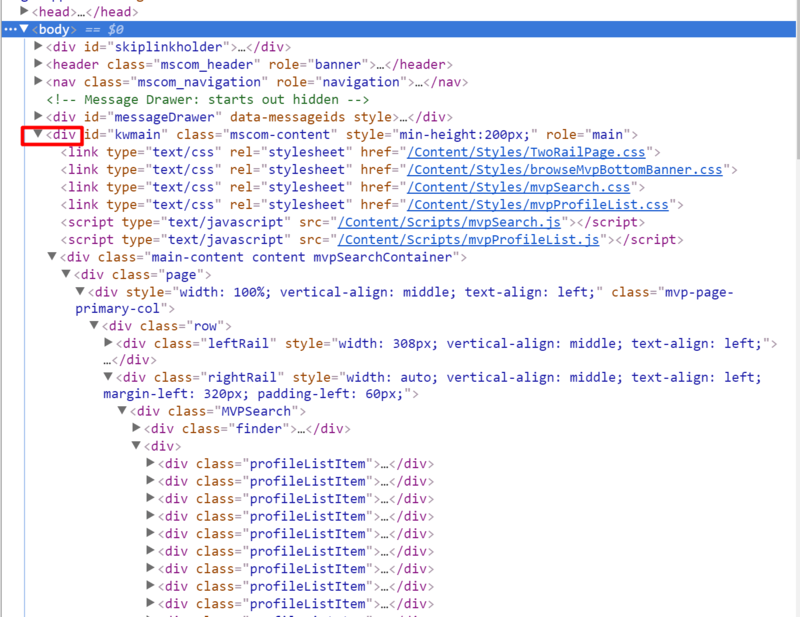 Let’s scroll up till we identify the <html> tag. 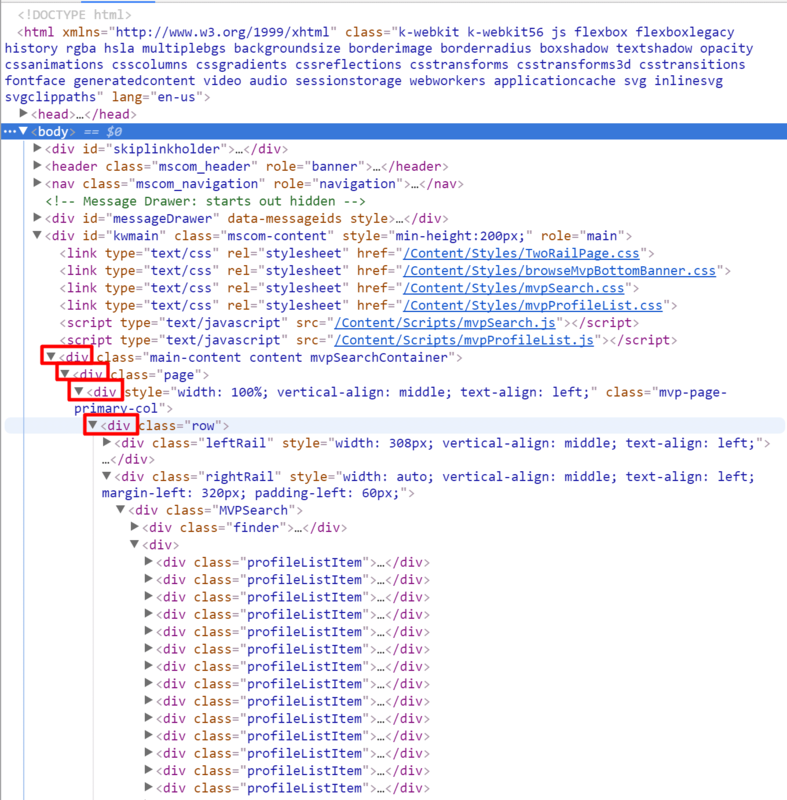 The children of <html> are the tags between <html> and the closing tag </html>. We will now drill down to the child <body>, as this is the tag that contains the search results. 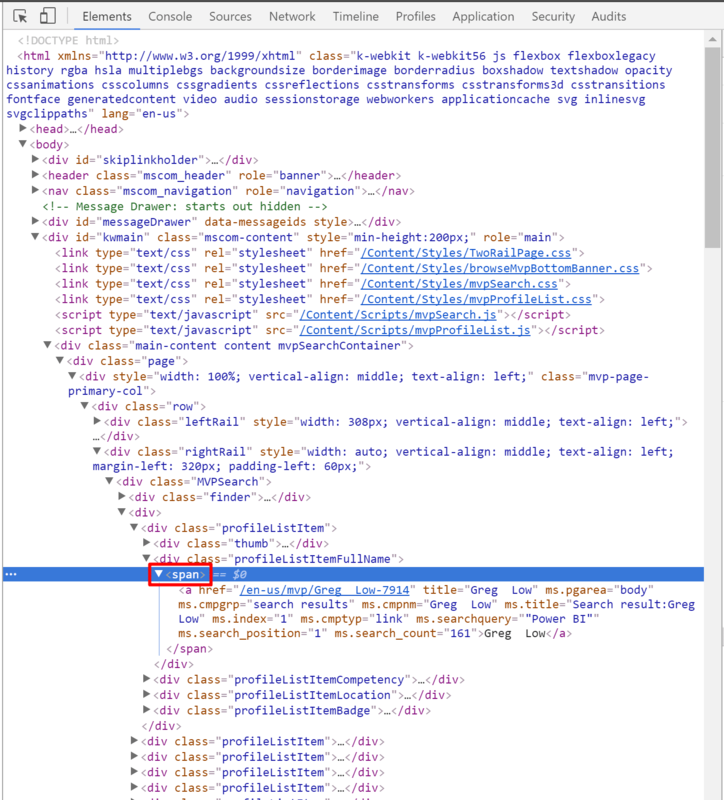 Before we drill down to <body> in the Query Editor, you can see in the following screenshot (inside the red rectangle) the entire tree-like structure of the tags that encapsulate our data. In the next series of steps, we will navigate the tree-like maze. Back in the Query Editor, let’s click the Table element (We are now in the HTML tag). Remember the <body> tag above? In the Query Editor, find the row with the BODY in column Name. Click on the Table object to drill down to the underlying elements. Now let’s drill down to the children of <body> in Google Chrome. We have a div, header, nav, div and another div, which is the parent tag of our table. So, we will need to drill down to that element in the Query Editor. 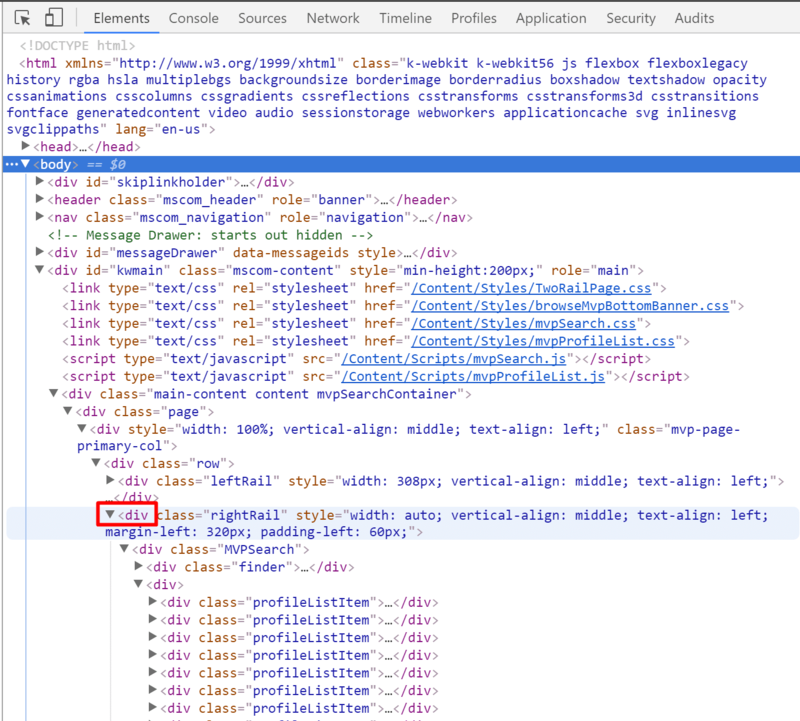 Note: The collapse/expand icons in Google Chrome will help you to identify the parent tag. Back in the Query Editor, let’s count the children of <body> till we find our div tag. Notice that in Name column we have the values: DIV, HEADER, NAV, DIV, DIV – The latter is our guy. 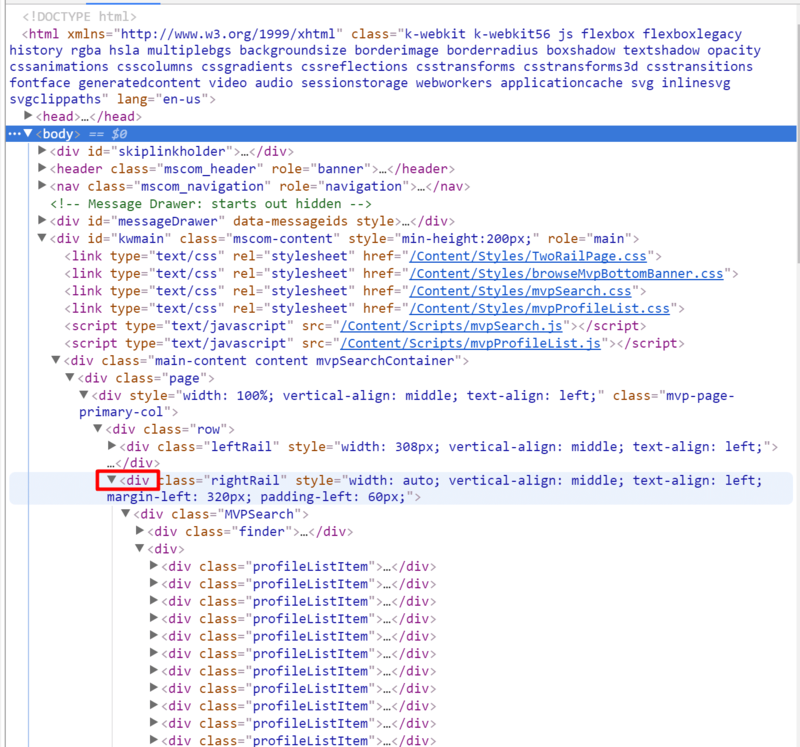 Let’s click on the Table object of that DIV tag (As highlighted in red rectangle below). Now, back in the browser, you will notice that there are four nested DIV tags, each is the first child of the parent DIV. Now we can see a series of tags: link, link, link, link, script, script and div. The div contains our search results. 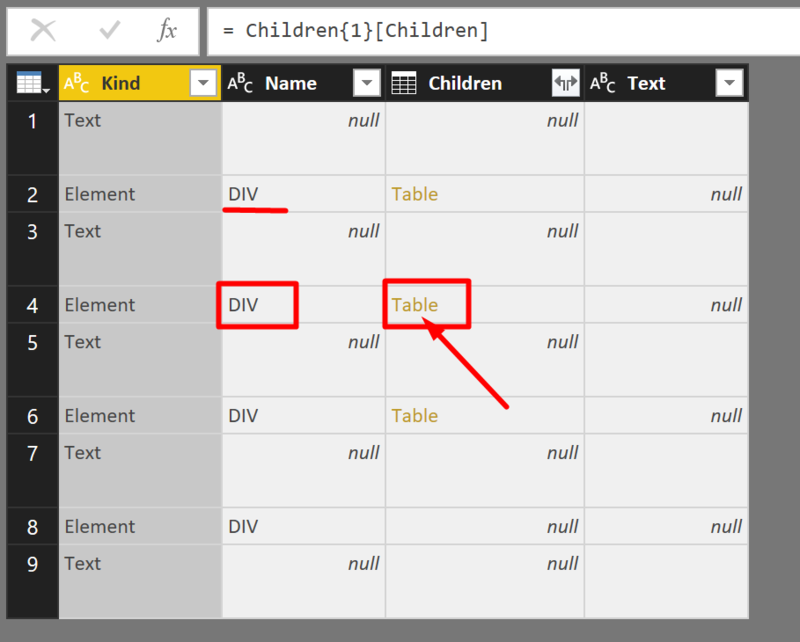 Find the first DIV in the Query Editor and click its Table object. 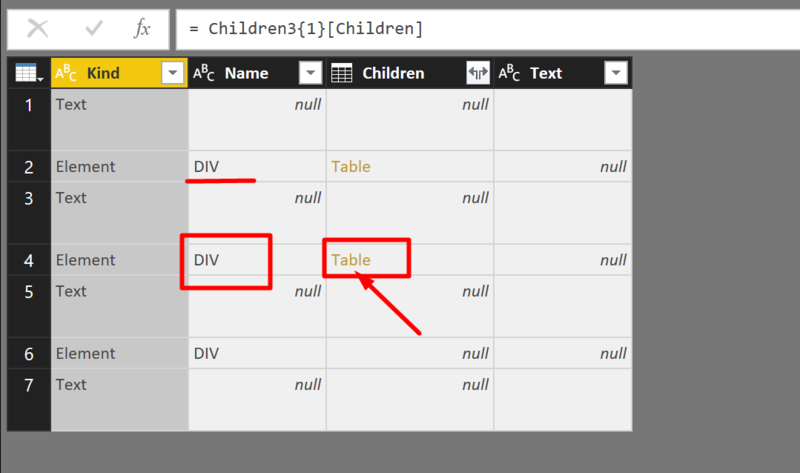 To match the next three nested DIV tags, click in Table object of the Children column in the first row three times. If by mistake, you click the Table element one more time, you can click the settings icon in APPLIED STEPS pane (as highlighted below), and then in the Navigation dialog, you can roll back to the 7th Children node below Document (as highlighted in the left red rectangle). Click the settings icon to roll back, if you drilled down too many steps. We can now see in the browser that the next tag that contains our desired data is the second div tag. 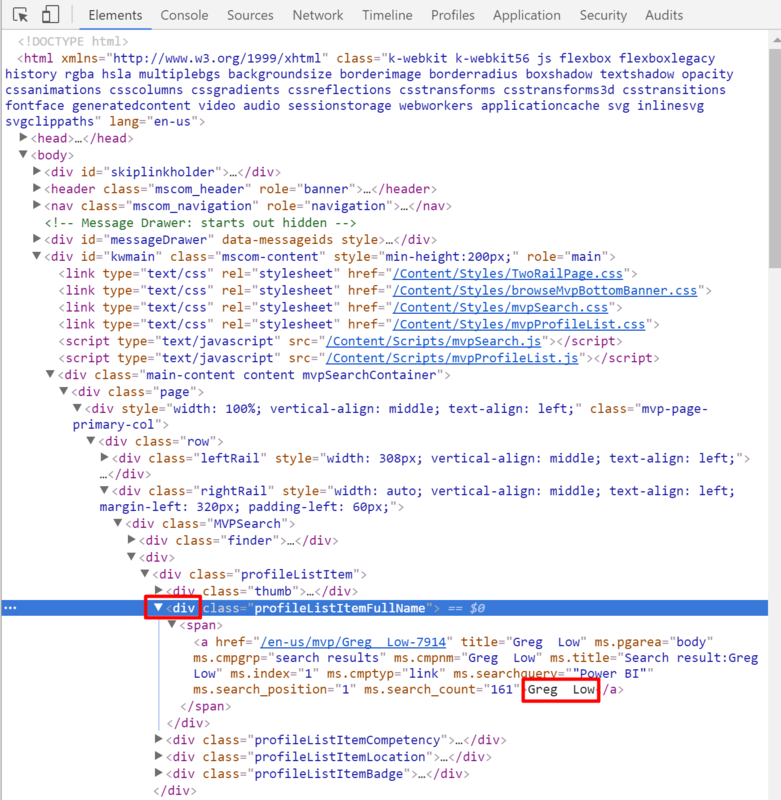 Let’s click on the second Table element in the Query Editor that is corresponding to the div tag in the browser. Next, in the browser we can identify the first div, as the element we should drill down to. So, let’s click on the one and only Table element in the Query Editor. Next, in the browser we can identify the second div, as the element we should drill down to. Back again in the Query Editor, let’s find the second DIV and click its Table element. Finally, by drilling down the Table objects in the Query Editor that match the tags in the browser, we reached a crucial step. The Children column contains our data. For the first time, we have reached into a step with a large set of Table objects in the Children column. Now it is a good time to delete the columns Kind, Name and Text. And let’s remove all the nulls. 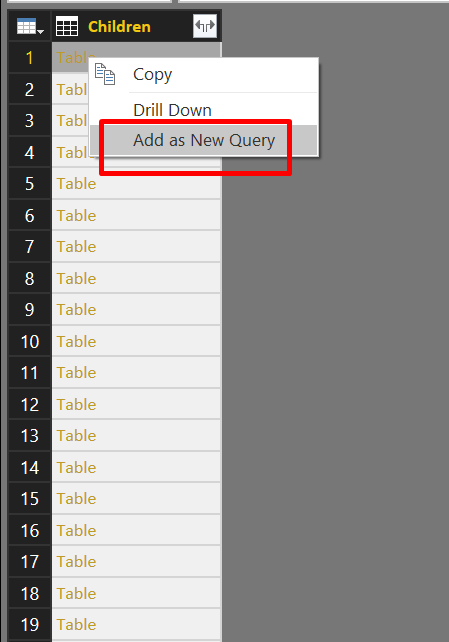 Since we have Table objects in the column, the Query Editor shows the Expend control instead of the Filter control, so there is no easy access to the filter pane. 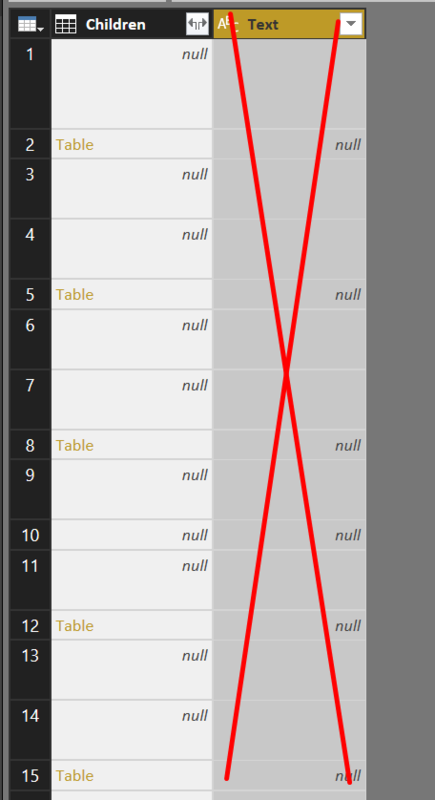 We can still filter out the nulls. In Home tab, click Remove Rows, and then select Remove Blank Rows. Now, when we have a single Children column, we have two different method to reach our data. 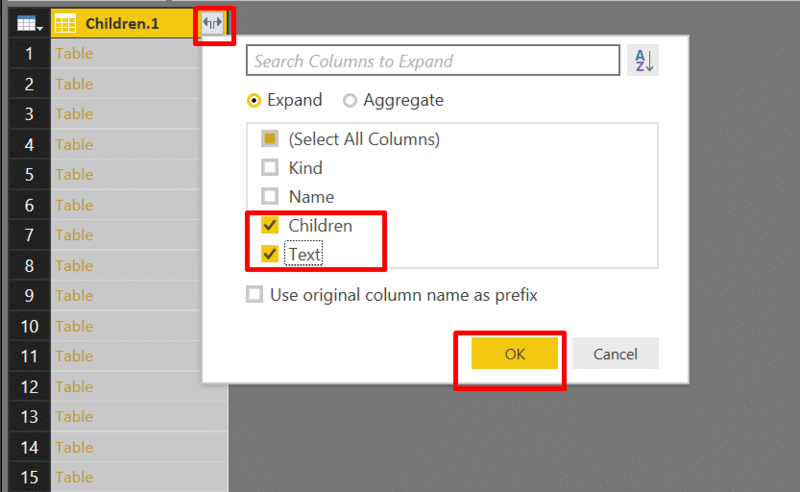 In this method, we keep expanding the Children and Text fields from the parent Children column. 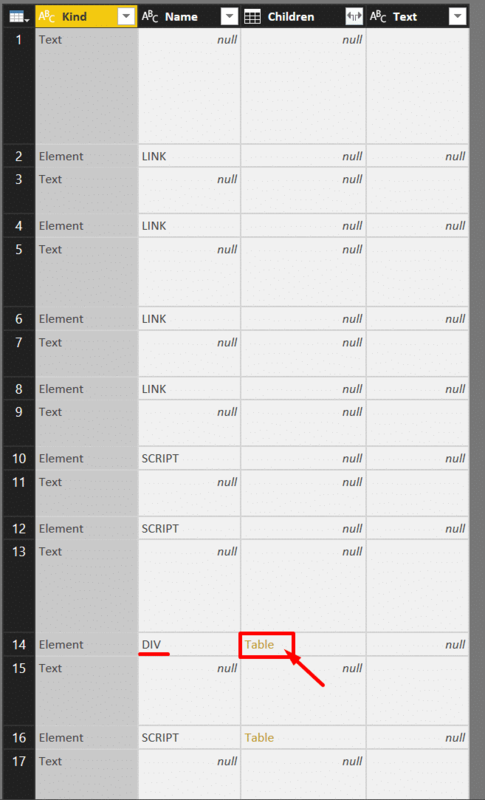 If Text column contains only nulls or empty values, we remove that column. Don’t apply a filter on Text to remove blank values. We need to keep the Table objects in Children. 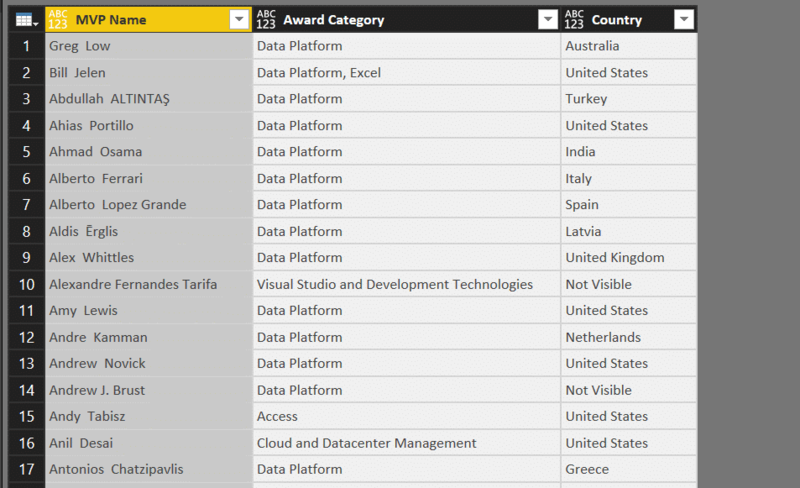 After the second expand, we will get the award category and countries in Text column. Now, when we have a single columns with trios of name, award category and country, we can apply a variation of the technique that I shared here. 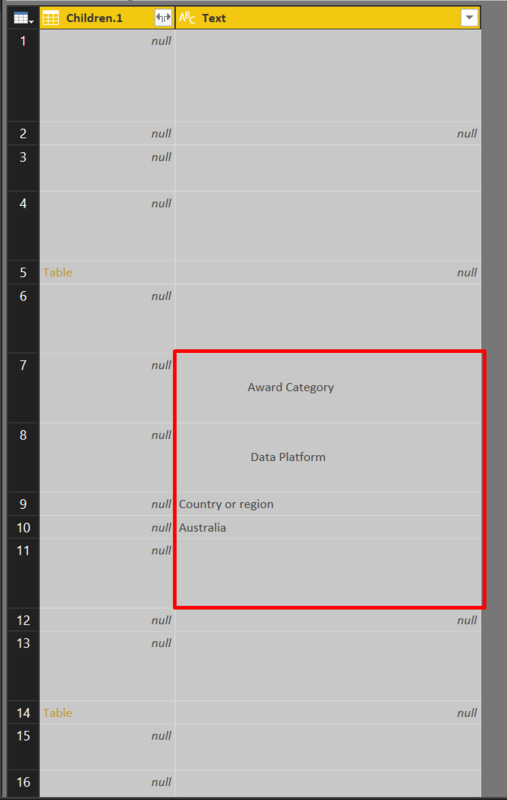 First, let’s create a new column that will map the data we have into columns of Name, Award Category and Country. In Add Column tab, click Index Column. Select the Index column, and click Standard, and then Modulo in Transform tab. In the Modulo dialog enter 3 as the Value and click OK. Rename the Index column to Column. Now, let’s define a new column that will map our records into row numbers. In Add Column tab, click Index Column. Select the Index column, and click Standard, and then Integer-Divide in Transform tab. In the Integer-Divide dialog enter 3 as the Value and click OK. Rename the Index column to Row. Now, let’s pivot the table. 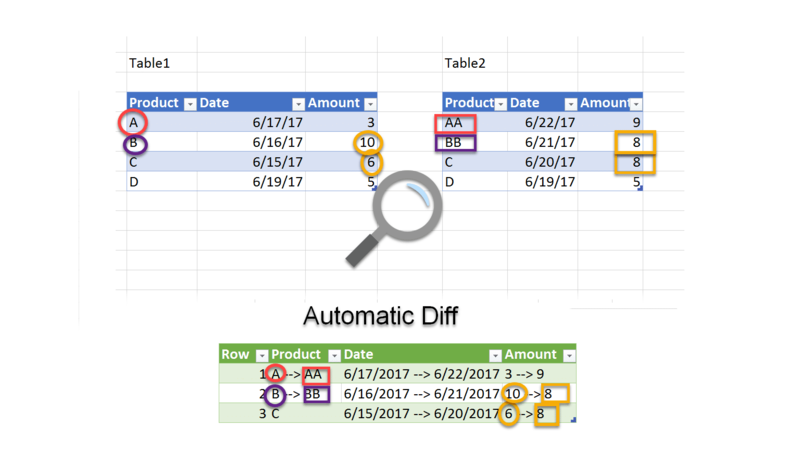 Select the Column column, and click Pivot Column in Transform tab. In Pivot Column dialog, select Merged as the Values Column, expand Advanced options, and select Don’t Aggregate in Aggregate Value Function drop down menu. When you are done, click OK.
We are almost ready. 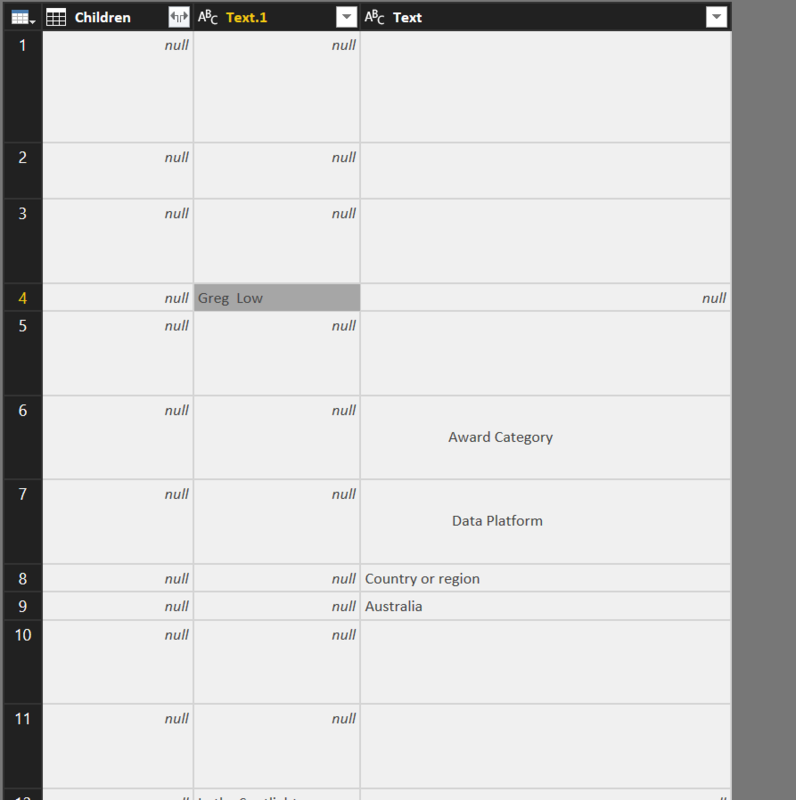 Remove the first column and rename column 1 to Name, column 2 to Award Category and column 3 to Country. We can now click Close and Apply in Home tab, and load our MVPs to Power BI. We will now drill down to the first Table object to work on a single MVP entry, and extract the MVP name. Then we will create a generic function that can be reused on all the MVP entries to extract the names. Right click on the first Table object, and select Add as New Query. Now, let’s find the MVP name in the HTML. We can see that we need to drill down to the second div tag. Back to Query Editor, we will click the second Table object that matches our finding above. Back in Chrome, we can see that the next tag is span. In the Query Editor, you can find the SPAN tag. Let’s click its Table object. Finally, we reached the actual tag that contains the MVP name. It’s an <a> tag. The name of the MVP is wrapped between the opening <a …> and the closing </a>. Note: In this article, we will not cover the method to get hyperlinks. There is a different method to do it. Unfortunately, in this technique the href attribute is ignored by the Query Editor. Back in the Query Editor we can click the Table object of tag A. Finally, we found our MVP name in the Text column. We can right click in the cell and select Drill Down. Now, let’s click Advanced Editor in Home tab. We can now rename the new function query as FnGetMVPName, return to the first query and click Invoke Custom Function in Add Column tab. In Invoke Custom Function dialog, select FnGetMVPName as the Function query, ensure that Children column is selected as Source (optional) and click OK.
Now we have the MVP names in the new column. To obtain the Award Categories, we can repeat the method that was applied for the names. 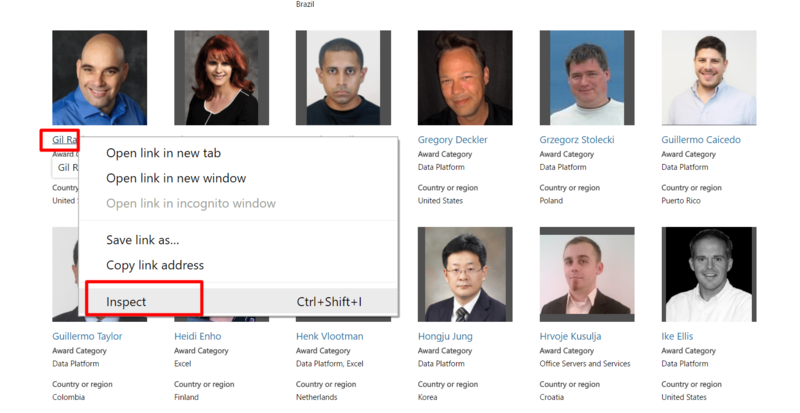 Use the browser to learn how to find the relevant tag that contains the award category, and navigate to it in the Query Editor. 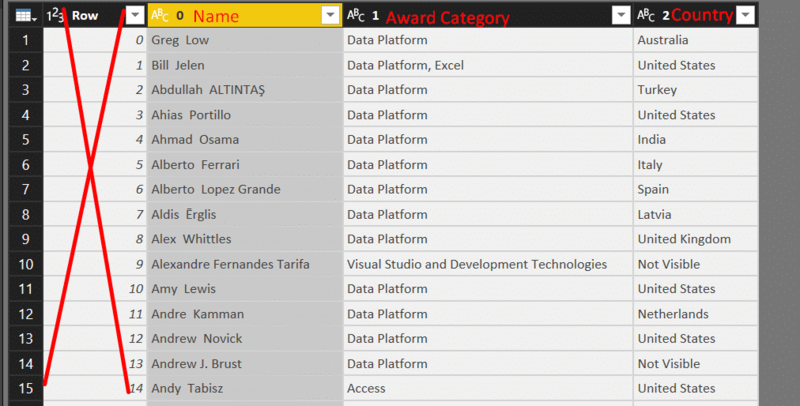 Then create a function that extracts the award. Repeat similar steps to obtain the country. Here is the final function. Let’s call it FnGetCountry. Now, use the Invoke Custom Function on the two new functions. Remove the Children column and we are done. 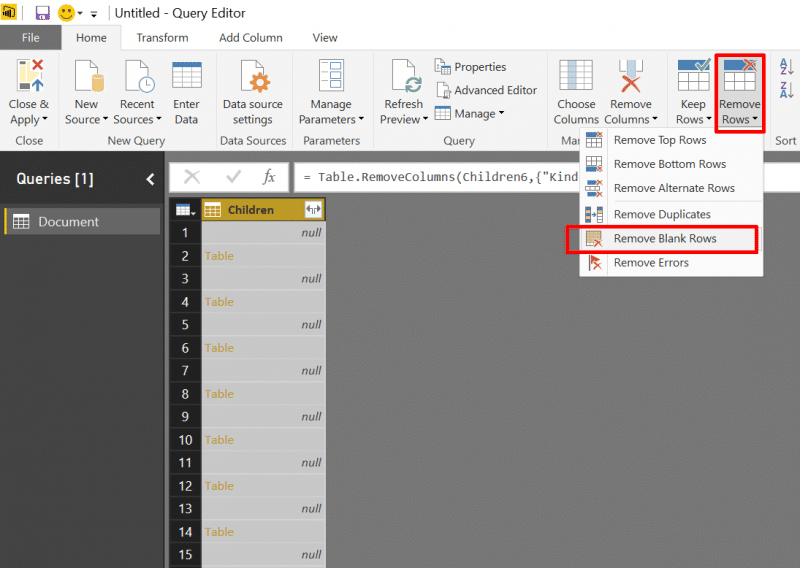 For basic tables that are implemented with the <table> tag (as typically found on Wikipedia), you can enjoy the built-in capability in Power BI and Power Query in Excel, and navigate directly to the tables. However, in many cases, the tables are dynamic in nature and implemented in a tree-like structure which is not easily accessible through the Query Editor. In this blog post, we figured out how to navigate the tree-like maze of Children/Table elements and extract dynamic table-like search results from web pages. We demonstrated the technique on the Microsoft MVP website, and showed two methods to extract the data. We briefly discussed how to refine the search to include all the results in a single page, and shared some pointers that will show you how to iterate over multiple pages, if you cannot get the entire data set in a single call. Understand that almost any minor change in the structure of the HTML page, will lead to refresh errors. You will often need to go back to the queries and fix the Children/Table navigation sequence. So, web scraping is perfect for ad-hoc reporting, and less suitable for wide scale production-level reporting. What’s next in web scraping? How to extract href attributes. Hope you enjoyed this blog post. I’ve done this so many times; drill down/up retry…clean up etc. I just wish there was a simpler solution. F.ex. 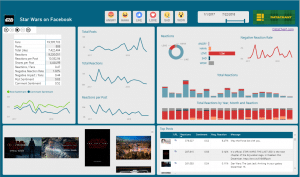 an graphical interface – to just point and click at the right level. I wonder if there is a solution to access password protected websites with power query? In case of negative answer, do you know if there is any resolution on this by power query develop team? You can see that there aren’t any votes. Perhaps you can try to influence the data provider to support Web API, or an import to CSV that you can automate using UI capturing tools. Is there a way to scrape the web if the URL is embedded in the dataset I’m loading? Hi Rajesh, Could you elaborate? Could you elaborate what’s not working, and blocked by Microsoft? Microsoft changed the URL Structure of the files on one drive – try connecting to this file on my one drive – wont work with the URL hack mentioned on SQL Chicks blog. Remember I’ve been waiting for this post from you since early Feb? Finally I found it the other day. However, to my expectation it’s not enough : In addition to the 3 items covered in this post could you please add two more columns – image url and profile url? You know even with the simple scenario I still wondered how to get the country icons from Wikipedia not to mention the Microsoft MVP website. I could not get “find the MVP” dataset. Could you share it with me by publishing it? Sorry, not yet. But you can get it by following the steps of this tutorial, and then extract the profile and photo URLs as shown in the next post. Good, That’s what I really need to learn instead of just harvesting a finished goods from expert like you. I can’t wait to see your next post. Thank you again. Hi Gil – Are you able to pull data from an Excel File – stored on one drive personal using the URL hack mentioned by Melissa’s blog – Could you share the steps. It’s better to move the file to OneDrive for Business and avoid this technique. To check if it is possible, try to find your Excel data in the browser’s HTML source, when you view the source. @Frank WOW – WOW – WOW !!! @Gil – Using this method, when the table you want is in the default landing page, it works great. But, let’s say that you are going to a site that has a different table for each month of the year (and the URL doesn’t change based on the month). The default landing page and table is January. But, if I am wanting to drill into the data and find the table for March, how is that done? Can you share the page? If the page URL is missing the month information, I would try some reverse engineering, and check the HTTP headers. Perhaps the data will be in a cookie. But most likely, you will not be able to get this data. @Gil – Thanks for your blog and detailed explanation! I am facing the following challenge: I need to scrap the data from over 1,000 webpages. Each page covers technical data of a certain vessel. I have the URLs of each webpage and if the pages would have been built up of tables… no problem. But the webpages do not use tables. Your tutorial helped me to grab the data of one webpage and now I duplicate the query and replace the URL in the source line of the query code. But, well, doing this a thousand times seems ridiculous. Do you know a way? This is fantastic. Here’s a problem though: different computers might see different element structure in the HTML, meaning a file that works on one might not work on another. A query I wrote to scrape info from the Excel Uservoice site works on the PC I constructed it on, but not on the other PC I subsequently sent the file to. Looking into this, I see that HTML structure for the same site differs between computers, meaning the query bombs out. 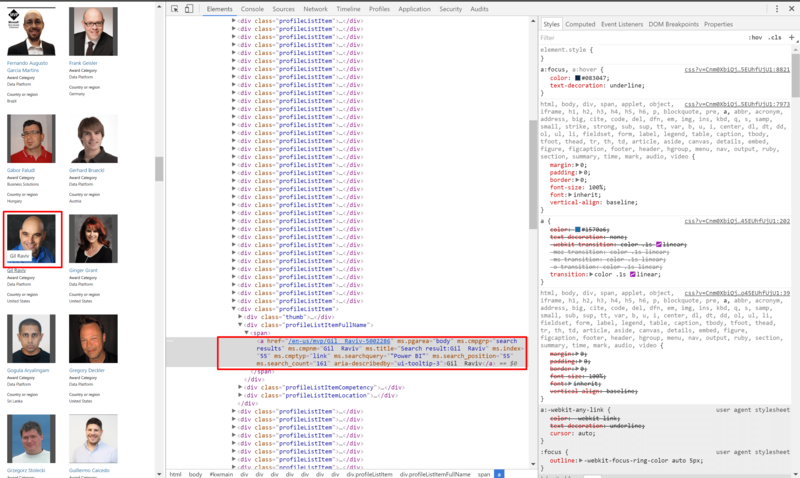 On the first computer, Inspect Element shows that the HTML structure is identical between IE and Chrome browsers. Whereas on the second computer the IE structure differs from that seen under either IE or Chrome on the first comptuer. Okay…a little over my head with this. Adding [Headers=[CacheControl=”no-cache, no-store, must-revalidate”]] to my query doesn’t break it, but doesn’t fix the issue on the other computer when I email the file across. And replacing that snippet with [Headers=[CacheControl=”no-cache, no-store, must-revalidate”]] returns the error “[DataSource.Error] An unknown error occurred when navigating to the web page.” on both computers, so I presume the syntax isn’t quite right. 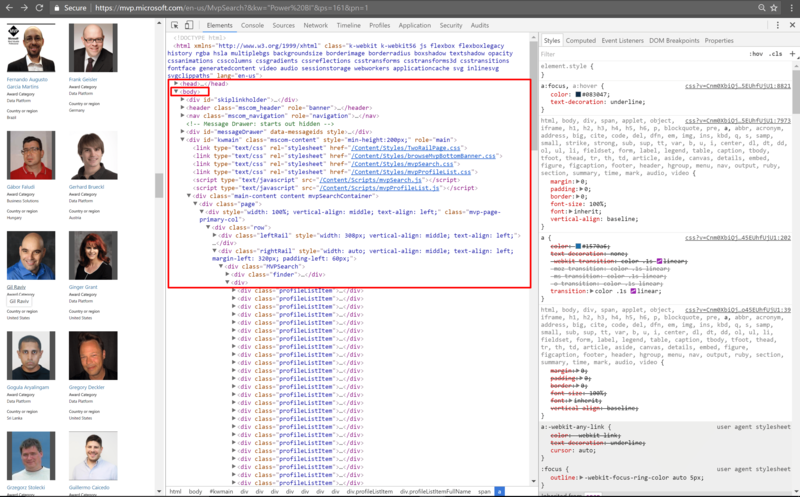 I also note that on the second computer, using Inspect Element shows that *all* the web browsers I have tested differ from the ‘schema’ structure shown in PowerQuery. So from this, I presume that PowerQuery uses a built in browser in Excel, and so I’m unsure whether it is possible to manually clear cookies from that browser. Let’s continue offline. My email is [email protected]. Would love to help you. Awesome…thanks Gil. Just after I posted this, one of my colleagues noticed that on his PC there was a banner to do with cookies, and that was the next avenue I was going to tackle. I’ll let you know how I get on. Awesome resource, this. Hey…on another note, is there a global comments feed for this blog? Are you asking about the ability to post comments below the home page? Or to see all recent comments across all pages? Are you looking for some information, or want to share? This is great, but I am wondering if anyone has any shortcuts on getting to the right place on the tree. I am pulling from a website that I just can’t get the correct branch on. 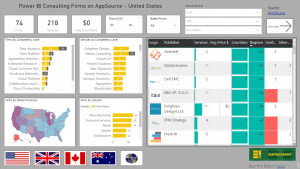 Thank you for the post, Can I grab data from a published Power BI report to web by using this technique?, or maybe shall I use some extension to the browser, if it is so, do you know any? Thank you Gil, can I use this technique to extract data from Power BI published reports to web, or should I use a capture extension on Chrome for example, in case yes do you know any good one? I am not sure you can. 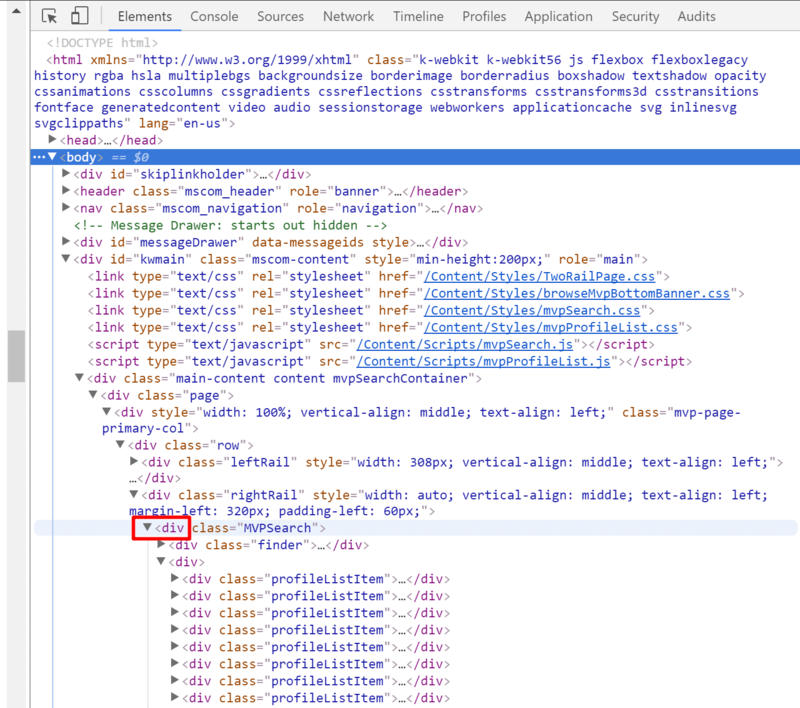 With the rapid changes you can expect to have in the page, what is the point in scraping it? The following is a link to a website that I use to find “interchangeable or equivalent” parts. For example, if I enter another company’s part number on the Federal Mogul website, it will give me the equivalent Federal Mogul part number. My issue is that I have to search 100s of part numbers, and can only do one part number at a time on the website. Is there a way to use web scraping to get a “table” of Federal Mogul part numbers and the “interchangeable or equivalent” part numbers from the other companies for which Federal Mogul has a matching part number? Hi, thank you very much for the article. I am a beginner and would like to extract data from google reviews. Please assist with an example of how to get this data into a table? Quite an interesting post for web scraping and thank you for sharing! 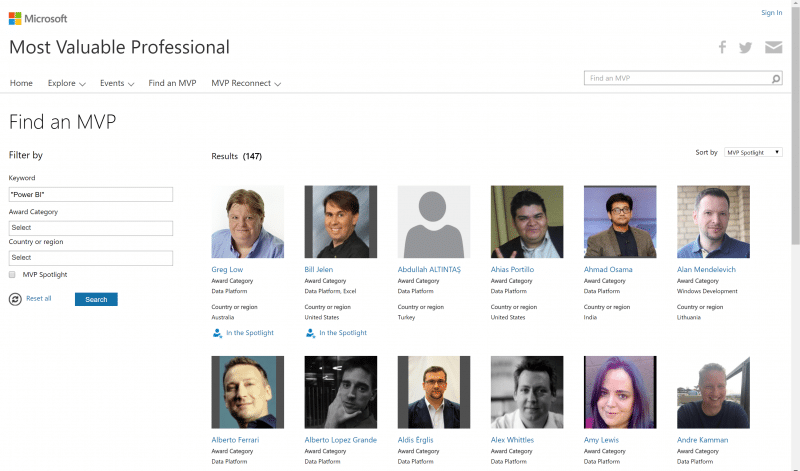 what if we assume that the number of MVPs is updated regularly e.g. weekly and we want to capture the latest #. if we do it like this, we would be missing the new MVPs details. correct? also, don’t you think that this “drilling” is time consuming vs the scraping using parameters? What if we used parameters and capture all the pages ? how we could capture the latest #? I tried to follow it, however I could not get to the result I wanted. I sent you my solution including two methods to extract the data and an additional function to get more than one stock. Want to say thank you for your excellent book. Its content has helped a few people around here substantially. Thank you! I have a scenario. We’re trying to scrape company reviews off of GlassDoor for an ad hoc HR project. 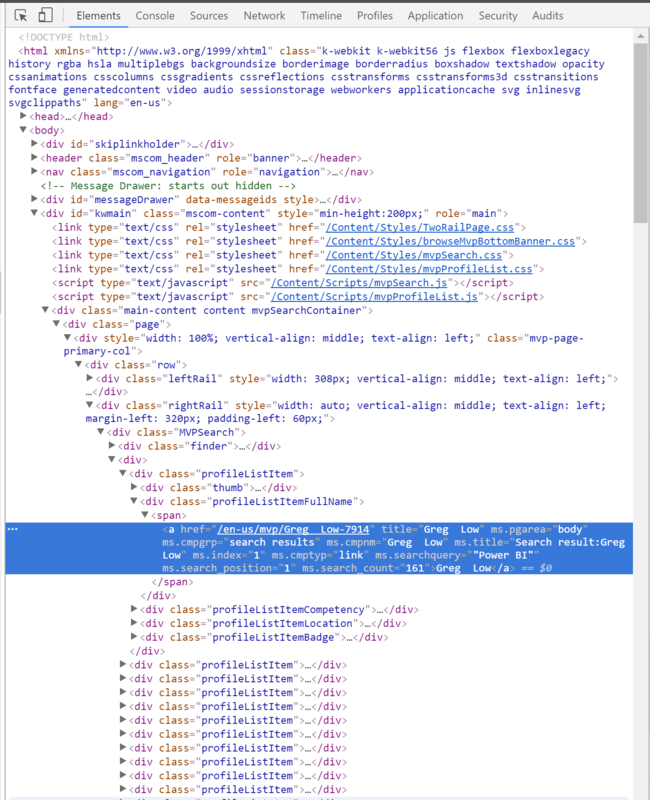 GlassDoor has a feature that generates some relevant evaluative phrases from the review body, stored in an HTML element called a “FlexGrid.” Each phrase (“Recommends”, “Great Pay”, “Bad Management”, etc.) is a separate element in the FlexGrid element, and there’s 1 FlexGrid per review. I’ve attempted to pull those phrases with a List.Generate calc column that evaluates the number of keyword Children in the FlexGrid for every review and applies a drilldown sequence to get at the phrases in each Child and make that an item in a Flexgrid phrase list for that review. In the below, [Review Body] is a calc column containing a table with elements for the FlexGrid (if present), review body text and elements for other stuff. My List.Generate calc column is returning lists with 1 error item that runs “Expression.Error. The field ‘Review Body’ of the record wasn’t found. Details: count =0).” I think the issue has to do with the use of brackets and with scope changes when referring to a Column inside of List.Generate. Any comments on how I can modify the code to get what I want? Thanks. First of all, thank you for reading the book. I am glad it helped you and your colleagues. Would be awesome if you share your review on Amazaon. Regarding the web scraping. I am not sure I can find sufficient time to look at your code and help, but feel free to send it by email: [email protected]. Your book’s been a real resource. Let me know if you have a preferred method of shout-out or social media support! I think my question above on methods to run multiple parallel drill-drowns on one table to get at similar elements that are at the same stepwise depth is important here. Thanks again. Any idea on how to manipulate the table selector (Annual /Quarterly) to extract Quarterly data instead of Annual data which appears in the initial page? I am sorry, but I don’t have the bandwidth to analyze this website and provide any advise, beyond this one: Please consider using Web APIs instead of web scraping. Especially for public financial data. I have a query , Suppose if are dynamically importing the data from multiple web pages. But in my case there may be cases where particular site link no more valid/ exist in that case , How can I modify the query so that it ignore if any source data is not exist ?